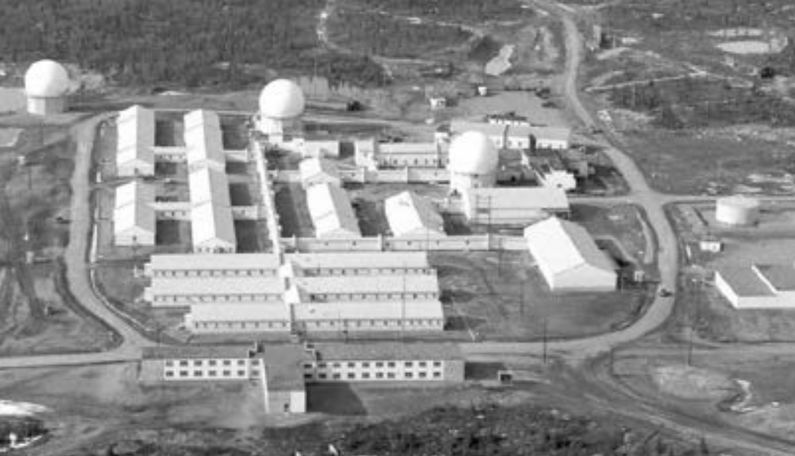 King Salmon Air Force Station (1951-Present) - A Cold War U.S. Air Force Station, part of the Alaska AC&W Radar Network. Initially functioned as a manual Ground Control Intercept (GCI) radar site, with a Permanent System ID of F-03. Later redesignated a surveillance site feeding manual track data to Murphey Dome Direction Center. Became a minimally attended radar site in 1984 and was redesignated as King Salmon Long-Range Radar Site with a JSS ID of A-07. Now feeds radar track data to the FAA Anchorage ARTCC (ZAN) and to the Elmendorf NORAD Regional Air Operations Center (RAOC). Active Long-Range Radar Site (LRRS) with an FAA ID of ZAKN..
King Salmon Air Force Station 1950s. The Middle Radome is the Search Radar and the other two are Height-Finders Radars. The Operations Building is in front of the Search Radar Tower. The T Shaped Building in the foreground was designed as Senior NCO Quarters. Construction began in 1950 and was completed in October 1951 by Gaasland & Company for $3,677,371. The site became operational in November 1951 as King Salmon Air Force Station manned by Det F-3 of the 531 ACWG. In December 1952 the 705th AC&W Squadron was activated to operate and maintain the site. In March 1953, King Salmon was converted to an air defense direction center and later a NORAD Control Center (NCC) responsible for air defense in the southern sector of the Alaska NORAD region. King Salmon was one of the easier Alaskan radar sites to build and support because it was colocated with the King Salmon USAF Forward Operating Base (FOB) which had two operational runways. The first intercept of a Soviet bomber by a U.S. aircraft from King Salmon occurred on 2 Sep 1965. Initial radar equipment included the CPS-5 search radar and later an FPS-3 search radar and an FPS-6 height-finder radar. These radars were upgraded to one FPS-20A search radar in 1958 and one FPS-90 height-finder radar. Later, the FPS-20A was upgraded to a FPS-87A search radar. Radar track data from these radars was manually passed to the Murphy Dome Manual Direction Center on voice circuits. The FYQ-9 Semiautomatic Data Processing and Display System became operational in 1965, eliminating the need to pass aircraft track data manually. The Elmendorf ROCC evolved into the Regional Air Operations Center (RAOC) which now operates with the Battle Control System-Fixed (BCS-F) FYQ-156 computer system. The RAOC is currently a component of the Alaska NORAD Region (ANR) and is operated by active Alaska Air National Guard members, Canadian servicemembers, and active duty augmentees. By 2011 the FPS-117 MAR radars were outdated and increasingly unsupportable because parts and components were no longer available. In 2011 the U.S. Air Force awarded Lockheed Martin $46.8 million in contract options to begin modernization of 29 long-range radars. Under the EPRP contract, Lockheed Martin was to modernize 15 radars in Alaska including the King Salmon FPS-117. The last site was upgraded in June 2015. The King Salmon LRRS also feeds radar track data from the search radar and IFF systems to the FAA's Anchorage Air Route Traffic Control Center (ARTCC) for management of civilian and military aircraft in the Alaska airspace. The FAA Identifier for the King Salmon LRRS is ZAKN (or just AKN in some lists) and the Anchorage ARTCC FAA Identifier is ZAN. The physical plant of the King Salmon AFS was not a split site and the main operations area was colocated with the cantonment area. There is some evidence that the original radio transmitter site and radio receiver site were separated from the main site. 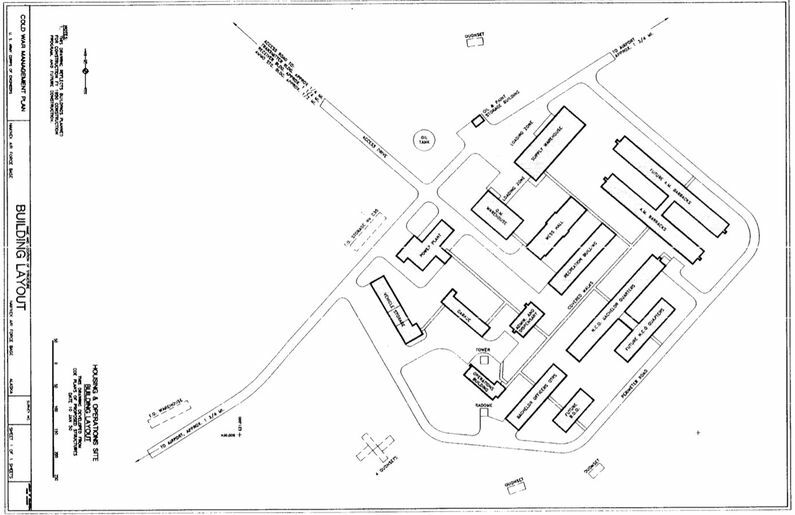 The main site housed the radar towers, the power generators, the operations area, the enlisted quarters (BAQ), the bachelor officer's quarters (BOQ), the NCO quarters (NCOQ), the orderly room, the dining hall, and other support buildings. No family housing was provided as this was considered a remote unaccompanied tour (1 year). King Salmon Air Force Station Original Plan. Separate radio receiver and transmitter sites housed the radio equipment for directing aircraft intercepts while the site functioned as a GCI site. Some evidence that the GATR site continued operation after the FPS-117 was installed and the AC&W squadron was deactivated. The King Salmon White Alice tropo site was built in 1955-1956 and activated on 25 May 1957. The equipment and power building was 4160 square-feet. POL storage included three tanks totaling 3000 barrels. The WACS site was inactivated in August 1979 and replaced by an Alascom-owned satellite earth terminal that was relocated closer to the airport terminal. The White Alice site was remediated. Active long-range radar site but many of the old AC&W site buildings have been demolished. The site has also had an environmental remediation project that has further erased some signs of the old AC&W site and all of the White Alice tropo site. Location: King Salmon in Bristol Bay Borough, Alaska. Denfeld, D. Colt Ph.D., The Cold War In Alaska: A Management Plan For Cultural Resources, 1994-1999, U.S. Army Corps of Engineers, August 1994, 327 pages, Pdf, page 157-158, 237-238. History of the Aircraft Control and Warning System in Alaska: Air Defense of Arctic Skies, Argonne National Laboratory, Illinois, 2002 updated 2013, 140 pages, Pdf, page 35-38. Top Cover and Global Engagement - A History of the Eleventh Air Force, page 14. This page was last modified 21:27, 3 January 2019 by John Stanton.